Now that days are getting shorter and shorter, I’m always surprised how early the sun is setting. By the time we are home from work or done with the day’s errands, we often come home to a dark house. As a result, we will be using lamps more frequent and in places that we typically don’t have too. The process is very simple. Just bring your lamp to our electrical service desk any day that is convenient. Once in-store, we will ask what your concerns are and what you would like to have fixed. We grab your name and phone number and that is it! Repairs typically take about a week, but sometimes it can be quicker than that… just depends on the timing and what all needs completed! We will call you when completed, and you pay when picking up. 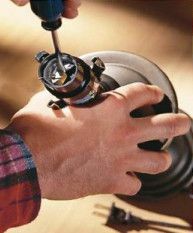 Of course, if you prefer to do the work yourself, we have all of the repair parts to do the work on your own time! If you have any questions, feel free to give us a call at 412-561-0922 and ask for our electrical department.